We have been in Miami for 3 days. Tuesday morning we hoped we could sail to Fort Lauderdale and then to Miami the next day. Our plan is to leave from Miami to Bimini. Although it was sunny in West Palm Beach that morning, more bad weather was predicted. Since we felt it would be unsafe to sail Blue Wing in the Atlantic for the first time in unpredictable weather conditions, so we decided to spend two days and just motor on down to Fort Lauderdale instead of waiting for better weather. Before we left that morning we decided to reinstall the dodger. 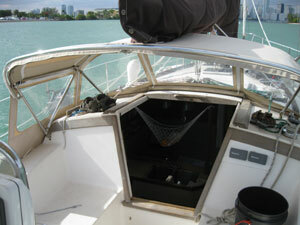 The dodger is the screen forward of the cockpit that serves as wind and spray shield and covers the companionway hatch. We took it off on our way up the ICW weeks ago. I am 5’3″ tall. The top of the dodger, which is solid canvas, is directly in my line of sight which creates blind spots to my left and right view of the waterway. After the stress of running aground twice on our journey down New River and motoring the boat for the first time, I decided I needed to be able to see as much of the water as I could. We stopped mid-trip and removed it. But after Monday’s night of rain I started to see the benefits of the dodger – it helps to keep the rain on the outside of the boat. Keeping dry is really nice. I decided I would just have to find ways to see over and around the dodger. It is slow going down the ICW in southeastern Florida. The waterway is heavily populated, lined with homes on either side and apparently, these waterway dwellers like to visit either side of the ICW often. Therefore there are lots and lots of bridges. Most of these are your â€œvertically challengedâ€ bascule bridge variety. Few of them open on demand and most only open every half hour. The benefit of this is that it allows us to practice going nowhere, idling forward and back, using the current and wind to keep the boat in one place. About 4 pm we made it to our desired anchorage in Delray Beach. We had stayed in this spot before on our way up the ICW. It was a very good place to drop the hook and only slightly trepidatious to get into, but once in the water depth was great. We slowly rounded into the anchorage and promptly ran aground. Luckily we have experience with hitting bottom. 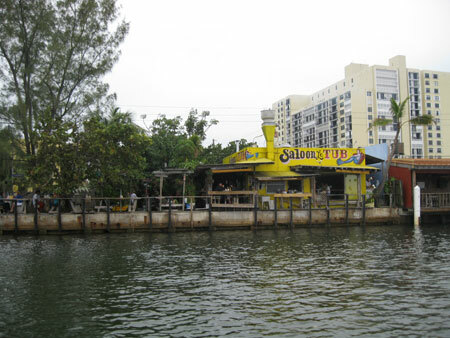 While on New River in Fort Lauderdale we ran aground twice. Although several towboats came by when were we stuck, they could not haul us out without giving them a whole lot of money. What they could do was stand on their tugs all day and give us advice. Now I had an opportunity to try some of this advice. After trying to back straight out of where we went aground, I turned the wheel hard left, pivoted Blue Wing, and then backed. We made a little progress. I went forward again, pivoting her, then back pivoting again, repeating this until finally we found a narrow escape and backed out into the waterway. We tried to enter the anchorage several more times, but the wind and current kept pushing us into the same spot where we got grounded and we backed out each time the depth meter dropped to one foot. It was getting late, but the weather was holding. We decided to continue on our way and look for a better anchorage. This was our first time motoring at night, but luckily this part of the ICW is lit up with the glow of lights from within multi-story glass front homes and flat-screen TVs. We found a great anchorage and had a much needed nights sleep. Wednesday morning we were looking at only 3 more bridges to Fort Lauderdale. This was nothing in ICW bridge time, we would be there in no time, so we decided to just keep on going to Miami. The character of the ICW changes quite a bit once you get south of Fort Lauderdale. First, you go through the shipping area, then lots completely undeveloped areas and wild vegetation. The approach to Hollywood Florida was populated with very modest home that lacked the glamour and money of the homes to the north. We saw divey waterside drinking and dining establishments and felt the urge to draw the boat alongside and have a cold one. The hotels were no more than three stories and looked like they hadn’t been updated since the 50s or early 60s. But just as we thought we would be motoring the low rent section of the ICW to Miami, we saw the high rises of Hollywood looming over the water’s banks in the distance. Boat being towed - not us! This leg of the trip from Fort Lauderdale was not as encouraging as the previous leg. We saw two boats being towed, one half sunk and another one run aground. Our approach to Miami didn’t give us any hope that any of these fates wouldn’t be ours. The channel is narrow and the markers are not easy to see and not very close together. Although there were a few tall fixed bridges here, their heights were not marked on the bridges, so we had to trust that our charts were accurate and that we could go under them. 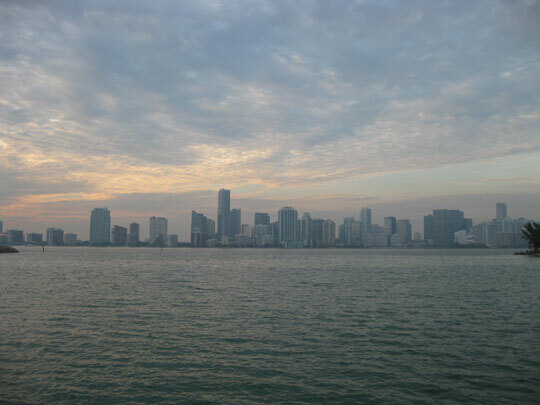 You can see the shallow water everywhere as you enter Biscayne Bay. 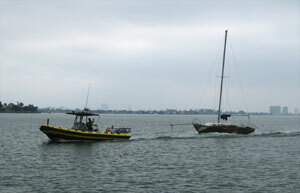 But luckily we had made good time and made it safely to our Miami anchorage in the overcast daylight. This entry was posted in Florida on the Water, Intracoastal Waterway, Life on the Water, Miami. Bookmark the permalink. ← February 6 – Splash!